I’ve spent the last 40 minutes laying down abstract track and watching abstract passengers got on and off at abstract stations. I enjoyed every second of it. 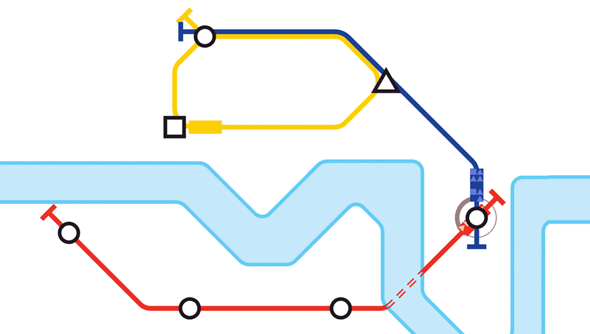 Mini Metro is still in alpha and already it’s a marvel. Your task is simple: you’re the transport director of a quickly expanding city, it’s on you to make sure the populace can get around the metropolis. It’s a bloody hard job. Designing your tube network is simple: you click a station and drag your mouse to another, drawing out a neat tube line behind you. As soon as you release the mouse button a train will start ferrying passengers between the two stations. You can continue expanding that line by dragging the little handle that’s at the last station on the line or start a new line (with a new colour) by clicking on another station. It’s an exceedingly simple system to use. That simplicity hides a complex core game. Stations can be triangles, circles, or squares – each represents a different level of popularity for commuters. As the game progresses people will start piling up on the platforms of the more busy stations, desperately needing your trains to take them to their destination. They’ll get angry and eventually complain if you don’t transport them. Complaints lead to failure. While the map starts with just three stations to manage and the ability to create three separate tube lines, more stations spawn in regularly. You’ll have to adapt your original lines to take in commuters from the new stations. Some intersections will become congested with commuters being dropped off from multiple lines. It’s horrible watching how far your trains are from a station that’s become full, a little countdown appears above the platform, reaching zero causes failure. That’s where the upgrades come in. Each week you’re rewarded with an upgrade. It could be a new tube line, or the chance to expand a single station on your network, or to add another carriage to one of the trains. The upgrades come infrequently enough that you’re forced to think very carefully before placing one. Pick the wrong line to expand and you’ll watch as commuters plug up a different part of your network. I’ve still not managed to reach more than 500 commuters – which is about three weeks into the game. Separate to the core game, the art style is fantastic. Modelled on the classic London tube map, all the colours and line angles are spot on. It’s a clean design which clearly conveys exactly what’s going on on your network. You can always see where there are trains and punters. The game’s only in alpha and future iterations are going to add in new maps, such as New York, to play with. I can’t wait to see what the developers come up with.